This page will help to keep you informed as to where I have been, what I'm up to and when I will be speaking or visiting near you! Brooke with Respected Historian Carmine Guica at Republican Registration Tent in Cavendish. August 22 - 26 - Caledonia County Fair, Lyndonville - Had hoped to visit all day, however a Wedding Commitment will pull meaway at 4. Hope to see you there! August 24 - 26 - Windham County Field Days, Bondville. August 26 - September 2 - Vermont's Biggest Fair - Will be there Monday and Tuesday. My dear friend, Fred Webster, has invited Donna and me to his recognition seremony for the Agricultural Hall of Fame at the Fair on Tuesday and if I am successful in the primary race, Gina Bullard from WCAX has invited me to be on her remote at the fair in the 5 to 6 slot. August 28 - Primary Day in Vermont - PLEASE come out and Vote! Whether you support me or my opponent (heaven forbid! ), the most important thing is to inform yourself and to make your informed choice count! If you are having a meeting or get-together and would like me to come by to chat or give a talk please call - You pick the Time, You pick the Place, You pick the Subject - I'd be honored to attend! January and February - After visiting Marty Searight weekly since the first of the year, inquiring as to whether we were going to have a "name brand" candidate to run against Sanders this year. By late in February, I am sure I was driving Marty crazy as she suddenly suggested that maybe I should consider running! Her famous "we can't beat somebody with nobody" - finally sank in! After discussing the whole thing with my wife, Donna, I decided to begin exploratory discussions with friends and neighbors. By the end of February, I was greatly encouraged by my discussions and Donna suggested I begin my petition drive at Town Meeting in our hometown of Washington. Washington is a pretty good cross section of "real" Vermont with many conservatives and liberals, working poor, blue collar and business folks - Donna suggested that if I could collect 60 signatures or so (out of the 120 that regularly attend) it would be an indicator of my acceptability to voters. March 6 - Town Meeting in Washington is a very civilized event. We generally have a cordial gathering of folks and discussions and disagreements are friendly - though occasionally spirited! The biggest bone of contention was the issue of the demolishing the old Town Clerk's Office. Underutilized since 2004, the building has housed our Town Historical Society and there was much debate over continuing to carry the expense of maintaining it or razing it for additional parking for the Town Library,next door. Much to my amazement, I was greeted with warm enthusiasm by everyone I asked to sign my petition. Neighbors of every political view were eager to sign - many "liberals" commenting " I've had enough of Bernie's loud talk and no action!' To my amazement, at evening's end, I had collected over 100 signatures! It seemed like a miracle at the time - I needed only 400 more signatures to qualify for the primary. I decided that evening that I would collect all of my signatures myself, as I knew this would be a wonderful way to meet folks and discuss their views and concerns - at the same time giving them the feeling of becoming vested in my campaign. May 29 - Wishing to be the first to turn in my Petitions at the Secretary of State's office - Donna and I arrived at a little after 7am (having been told that they opened the doors at 7:15), we were the first to file, a few minutes before 8, when the first staff member from the Elections Department arrived. Bill Sorrell's secretary was waiting in line just behind us and we had a few moments to chat! Donna took lots of pictures with Jim Condos, who "hammed it up" with me for the snapshots - however after the "photo shoot" he began having second thoughts and asked us not to use the pictures until after the Election! Later that morning, Jim seemed fine with having WCAX shoot footage with him and Randy - so I'm not sure what his problem was with a picture shaking hands with me - in any case I'm a man of my word so I will "embargo" the pictures until my Victory Party on November 6th! June 30 - I was invited to assist Scott Ranney and the Cavendish Republicans to run their Registration Tent at the Cavendish Historical Society's History Day. What a great time, the weather was picture perfect and I had the chance to chat with that rare breed of Vermonters - "rock-ribbed Republicans". One of the highlights of the day was to meet and chat with the respected Cavendish Genealogist & Historian Carmine Guica - who apparently knows where all the "bones" in town are buried! Carmine proudly fought in WWII and was eager to talk about his experiences. God Bless Those Who Serve Our Country to Protect Our Nation and Our Freedom, especially those spirited folks like Carmine! July 3 - League of Women Voters on the State House lawn in Montpelier for a meet and greet. A beautiful afternoon listening to concerns and fielding question about my positions. Strolled in the "lively" evening parade with fellow Republicans. July 4 - Fourth of July Parade with the "Willliston Republicans" What a wonderful crowd and dedicated Republicans who welcomed us. Despite the weatherman's predictions, we had a lovely sunny afternoon! July 6&7 - Enjoyed two days at the Windsor County Field Days at Springfield, manning the booth with the Windsor Co. Republicans. While Saturday's weather was spotty - Sunday was picture perfect! Randy spent some "quality time" with us doing his meet and greet. We had a visit from "Uncle Sam" who really spruced-up our spot. I think my fellow campaigners were surprised (if not impressed) that I was able to change the minds of several ardent "Bernie" supporters after a heartfelt ten minute chat - these folks have invested a lot of themselves in their affection for Sanders and it takes more time than "bullet points" and sound bites provide to win them over. July 12 - Remote interview with Dave Snyder at WPTZ / WNEE Channel 5. My promised seven and a half minutes was reduced to five minutes when I arrived and further cut to three minutes to allow them to cover a wildfire in the Adirondacks. All in all it when OK given the limitations. John gets his shot tomorrow, Friday the 13th - hum-m ! July 16 - "Meet the Candidates" Evening Boat Cruise on Lake Champlain aboard the "Northern Lights. My wife, Donna, and I had a wonderful time meeting new folks and "Catching Up" with old friends. My friend, Marty Searight kept an eye out for me making sure I was not overlooked on the speakers list. The lake was "quiet" and the food was great. We were honored to be seated with the Snelling family and enjoyed listening to their insight on Vermont Government and Politics. July 23 - Franklin County Republicans invited me to speak at their Candidate's Forum. The meeting was held in the Town of Franklin which is up at the Canadian Border, in God's Country! While roving the counryside. I stopped to get better directions from a real Vermonter on his 1952 Farmall tractor, with a twinkle in his eye he informed me "You can't get there from here!' after a pregnant pause and a little chuckle he gave me great direction to the Franklin Homestead. Cecil King was our host for the meeting that was well attended by over 40 of the party faithful. The meeting which ran until 10PM and It was after minnight before I got home, however it was well worth the trip up north. August 2 - Had a great time interviewing with Rob Roper on his True North broadcast on the WDEV Network. August 4 - Lunenburg Old Home Days in the NEK - spent some quality time at the booth meeting fellow Republicans and encourage converts! August 5 - Castleton Republican's BBQ - Good Food, Good Friends and Great Conservative Politics! We had a great time at on the lake chatting with the party loyals! August 6 - Channel 17 Live Candidates Forum with Nick Carter at 5:25 pm. My primary opponent didn't think it was worth the trip - Trust me I had a great time talking with Nick. After the allotted time, we spent nearly an additional 1/2 hour talking politics and Vermont History! 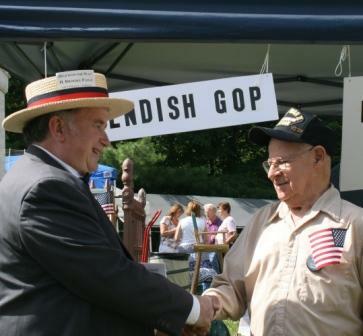 August 7 - 11 - Addison County Field Days, New Haven, I joined Brian Young and the Addison Co. Republicans. Rotten Weather - Great Crowd and wonderful booth mates - talking politics and history - while entertainig young folks in Phil Scotts miniature race car! August 8 - Caledonia Republicans Dinner at the Country Club, it was great to visit with those "rock ribbed" Republicans in the NEK. August 9 - Mark Johnson on the WDEV Network has offered to moderate a debate between John and myself from 9 -10 AM. Mark runs a fair and most balanced talk forum and I believe it was an excellent chance for listeners to compare our positions and ideas for getting the country back on track. I think John decided to engage me after finally realizing that, while I am very animated, I don't bite! I think the debate and the exposure on Mark's statewide show benefited us both. August 15 - VPR FORUM - Moderated one-on-one with my primary opponent at Noon, Had a lively, civil debate before an audience with many undecided voters! Lots of positive feedback, oyu can view the debate on the VPR web site. August 15 - Addison County Republicans meeting at Middlebury. John and I were questioned and debated. Tough crowd, hopefully they were convinced of te virtues of my positions. Time will tell! August 18 - Antique Benefit Tag Sale at the old Fairbanks Scale Works site, to benefit the St. Johnsbury History and Heritage Center - last chance to own a great piece of history! Peggy and the volunteers were just great! We had a lot of lookers and a surprising number of buyers. Unfortunately most were interested in the "smalls" - we had hoped to find homes for some of the fascinating large patterns. There was talk of another try in the fall, maybe late September. Stay Tuned!